Just over half a year after that Wayne Rooney moment, DC United travelled to Orlando City in Major League Soccer. Both teams won their previous matches, however, DC United were favourites. Orlando City only registered one win in their first four games while DC United’s Bill Hamid was yet to concede a goal in the 2019 MLS Season. This MLS tactical analysis will analyze the games key tactical themes and how Orlando almost clawed back a result. Orlando’s defensive shape remained unchanged from their trip to New York, with Ludovic Lamine Sané taking Alex De John’s spot in the lineup. The only other personnel change to Orlando’s lineup saw Dom Dwyer replace Santiago Patiño in the centre forward position. DC United remained in their 4-2-3-1 formation making no personnel changes after an impressive win over Real Salt Lake City a week earlier. The matchup was marketed as Nani versus Wayne Rooney. Ex-teammates for Manchester United battling it out in America for not only three points, but bragging rights too. After 90 minutes it was Wayne Rooney who had the last laugh, dragging his team over the finish line by the skin of their teeth. While not the most convincing performance of the season, DC United looked the most threatening team in the first half. Although they couldn’t quite penetrate Orlando’s five-man defence, two moments of magic from Wayne Rooney meant the Black and Red went into halftime with a two-goal lead. The first goal came after Rooney swung a freekick onto the head of Steven Birnbaum who headed the ball past a flailing Brian Rowe. The second goal was yet another Wayne Rooney freekick, however, the ex-England captain decided to go for goal instead. In the second half, Orlando substitute Chris Mueller caused havoc for the DC United defenders. Dom Dwyer headed home a Mueller cross with ease to score the third goal of the match. Orlando had a few more good chances to pick up a result later in the match. Unfortunately for James O’Connor, DC United saw out the match to win 1-2. The rest of this tactical analysis will analyze the key performances that shaped the match’s outcome. 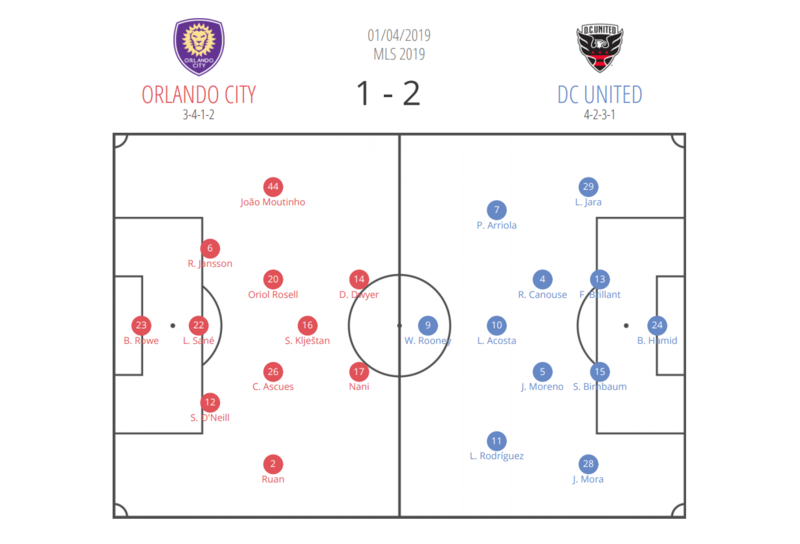 While Ruan was one of Orlando’s most prominent attackers against New York Red Bulls, the full-back had little offensive impact against DC United. Ruan attempted six dribbles in the match, five of which were unsuccessful. Once again looking back to Orlando’s success versus New York, Ruan and Moutinho shared an equal amount of responsibility going forward. Ruan attempted 44 passes while Moutinho attempted 49. Against DC, Ruan only attempted 38 while Moutinho had the most pass attempts of anyone on the field with 74. Despite being thrown into the game on the 15th minute, Chris McCann did an excellent job taking Ruan out of the game. In the following images, we can see how closely McCann marked Ruan. As Orlando possess the ball in the midfield, McCann tightly marks Ruan. 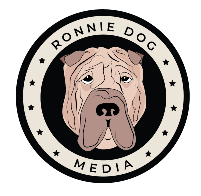 Whenever Ruan received the ball McCann stepped to him immediately. He also tracked the Brazillian’s run, giving him no space to receive it back. As soon as the pass comes to Ruan, McCann steps to prevent penetration on the dribble. After Ruan lays the ball off he attempts to find space in behind the defensive line. McCann tracks the run. Moutinho, on the other hand, was afforded much more space on the left side of the field. The following images show how much extra space Moutinho was given. When Orlando possessed the ball on the left side of the field, Moutinho was given much more space. When Moutinho received the ball the defender stepped to him but less aggressively than McCann to Ruan. As a result, Orlando attacked down the left side much more frequently, as shown on the following heat map. By taking Ruan out of the game DC United limited one of Orlando’s most threatening attacking players. Orlando City heat map provided by WhoScored.com. Orlando City head coach James O’Connor made two important substitutions around the 60th-minute mark that helped his team get back into the game. The first of those substitutions was Christopher Mueller on for Sacha Kljestan. As soon as Mueller came on he added much more dynamism to Orlando’s attack, pushing Nani to the right wing. Nani and Kljestan were hesitant to take players on but Mueller dribbled at players from the moment he came on. Mueller beats his players and creates an excellent goal scoring opportunity. As well as dribbling at the defenders, Mueller provided more options going forward with his linkup play. In the following sequence, Mueller links up with substitute Sebastián Méndez to break Orlando’s defensive lines. Méndez finds Mueller in space with a pass. Mueller turns towards the goal while Méndez continues his penetrating run. Mueller finds Méndez with the pass, who then misses a shot towards the goal. Orlando’s goal was a direct result of Mueller linking up with his teammates and dribbling into dangerous areas. His cross to Dwyer was inch perfect. When Kljestan was on the field he didn’t attempt a single dribble. After his introduction, Mueller attempted seven dribbles, the most out of anyone on the field. As soon as he came on Mueller changed the game, setting up the goal and hitting the post with a header in the last few minutes of the game. With a little luck on his side, Mueller may have won a point for Orlando. With a bit more time, he may have won three. While they walked away empty-handed, James O’Connor’s men can take a lot of positives away from this match. Orlando’s next MLS match is against Colorado, who are yet to find their first win of the season. DC United host LAFC – who top the MLS Power Rankings – as the conference leaders go head-to-head. Both teams are undefeated in the league and will be hoping to continue their winning form against the other.